SIGG stands for premium reusable water bottles. With over 100 years expertise “The Original Swiss Bottle” demonstrates worldwide quality and craftsmanship. The beautiful shape is one of the reasons that SIGG was incorporated into the collection of the Museum of Modern Art (MoMA) in New-York. SIGG bottles are 100% recyclable and contribute to improving the world´s carbon footprint. Can you say CUTE? Yes, I know that this is from the Kids line, but I’m a bit of a kid at heart, so this bottle will stay with me 🙂 My husband doesn’t really like purple horses anyway – lucky I do though! Riley will get this bottle when she’s old enough to use it. The drink spout is nice – I can see how this would be easy for a child to use. It’s a screw top with a dirt-proof cap – absolutely leak-proof. One turn and it’s ready to use. Plus the cap on the particular SIGG bottle I got is iridescent. Pretty for girly girls! SIGG Kids also has things for boys such as Destroy all Robots and Bones at Night. The .4L (13oz) size is perfect for children 3 and up. Also by SIGG are the Little Kids .3L (10oz) Water Bottles. 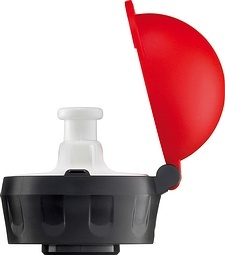 These bottle have the same leakproff cap as the .4L but smaller in size, great for the little hands of children ages 1-3 years. SIGG bottles also come in sizes .6L, .75L, 1L, and 1.5L (see bottle size chart for ounce conversion). Styles range from classic to designer, including the Limited Edition Vivienne Westwood line. (sidenote – Vivienne Westwood and my twins share the same birthday!) SIGG also carries SteelWorks, a line of coffee mugs, flasks, and more! Celebrity fans include Natalie Portman, Ryan Reynolds, and Heidi Klum. SIGG products are sold online at www.mysigg.com or find out where you can buy SIGG bottles near you!